Fig. 1. Facade of the Archaeological Museum of Chios on Michalon street. 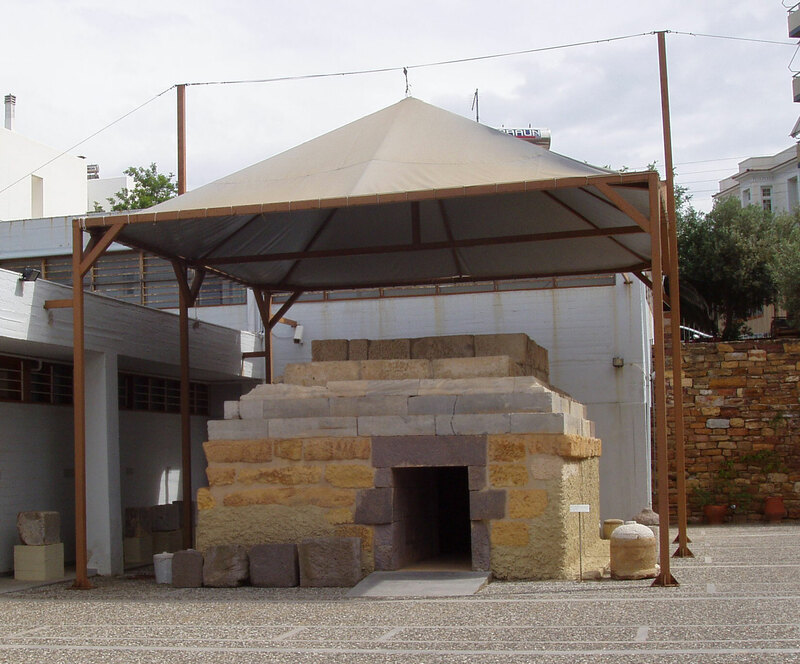 The building of the Archaeological Museum of Chios (fig. 1) is the work of the well known Workshop ’66 architects Dimitris and Suzanna Andonakakis who won first prize in the 1965 architectural contest. 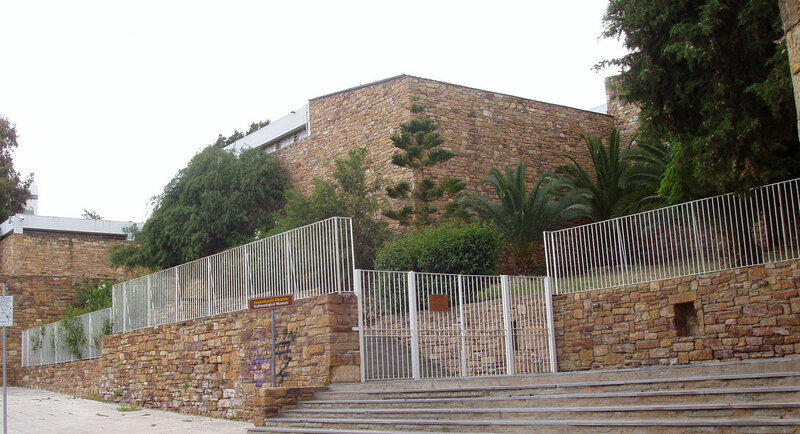 The museum is arranged on three levels, in a game of volumes that stand in sequence on the slope of a hill. One enters the lobby by a series of steps, the enclosed spaces are arranged round a central courtyard, while the masonry of local stone (from the district of Thymiana) covering the building’s exterior, contrasts with elements of bare concrete and glass (note 1). The museum has large courtyards where, after their tour, visitors can rest in the shade of trees and a small theatre with wooden bleachers in the upper west court where events can take place. A shop and cafe had been included in the museum’s construction, as well as a hall for screenings and events. 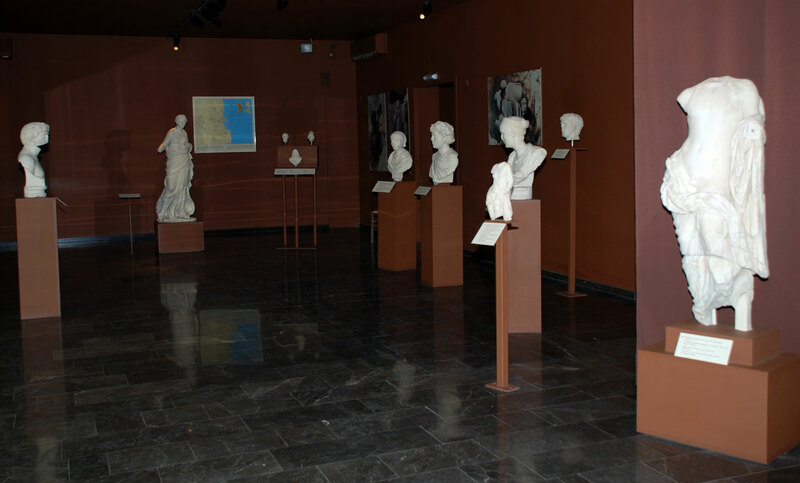 The first exhibition took place in the years following the fall of the military dictatorship, when Konstantinos Trypanis, a historian and literature scholar from Chios, was Minister of Culture. In 1987, the museum’s operation was suspended due to problems related to the building’s stability and necessary repairs were undertaken. 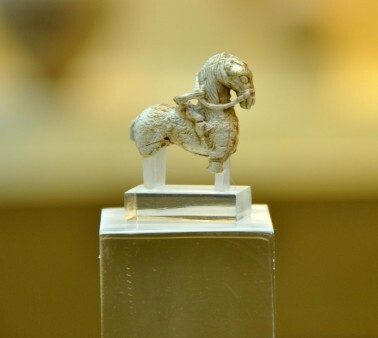 It reopened to the public in 2000, with a rich new exhibition presenting the Ionian culture of Chios and the role played by the island during Antiquity. 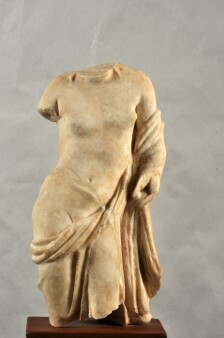 The exhibition areas contain finds from rescue excavations made by the Archaeological Service and the British School at Athens, as well as a mass of finds including sculptures (fig. 2), inscriptions and bas reliefs that had been collected since the late 19th century or occasionally handed over by the people of Chios. Inscriptions are exhibited in the western courtyard, architectural members from ancient buildings, including the columns from a small temple most possibly belonging to Hercules, found at the site of “Ano Phana” in southern Chios (fig. 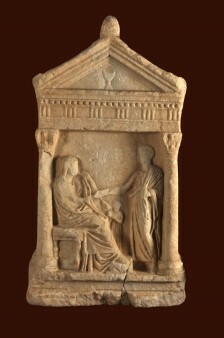 3), as well as a Macedonian type tomb of the 2nd c. BC (fig. 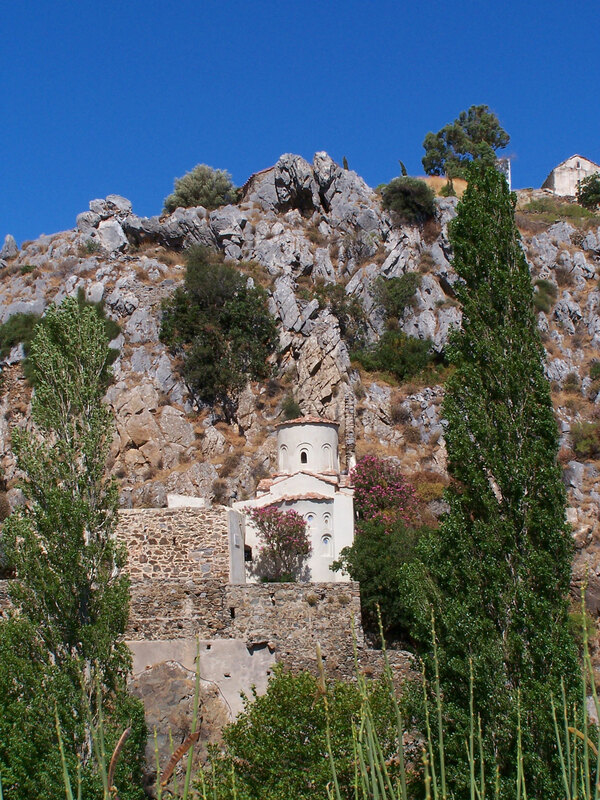 4) brought to light in 1980 in the Frangomachala quarter in the town of Chios (note 2). When visitors ascend to the third level, as they walk among the flowering oleanders, they can see parts of the decoration from ancient buildings and inscribed stones, while also exhibited in this area are sarcophagi and cist graves unearthed in rescue excavations around the town. All the above finds contain messages regarding the political, social and ideological framework that gave rise to them and also about the person or persons who made and used them. 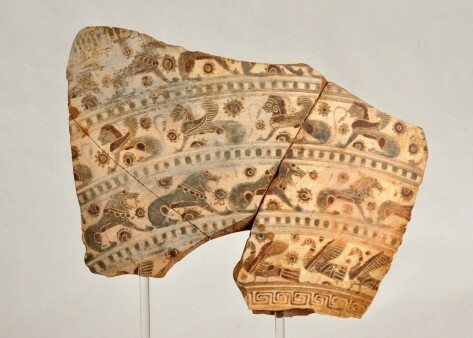 The particular strategic position of Chios, on maritime routes linking the eastern Mediterranean with the Black Sea and the island’s proximity to the shores of Asia Minor, led to its being inhabited as early as prehistoric times. 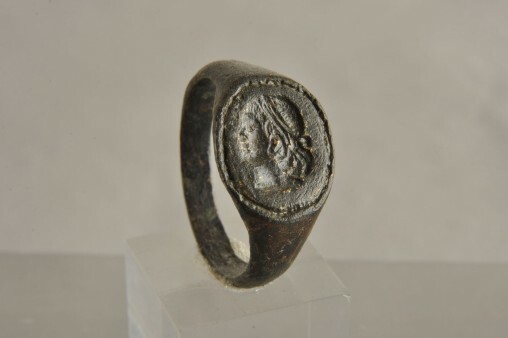 The most ancient archaeological findings come from Aghios Galas and Emporio and date from the Early Neolithic period around 6000 BC to the Late Copper Age around 1100 BC (note 3). On the site of “Aghios Galas”, both the 1938 excavations of the British School at Athens and later surveys by the Ephorate of Paleoanthropology and Speleology of Northern Greece proved that, since Early Neolithic times and up to the Middle Copper Age, one of the caves had been used as a dwelling place for a small community of people. Studying the data from excavations, surface surveys and more general geological features of the caves, it can be concluded that on the whole, these caves were not permanent habitation spaces for some groups or populations, but places used periodically by groups of hunters, farmers, owners of livestock or fishermen, giving them rough shelter for as long as their activities lasted in the area. 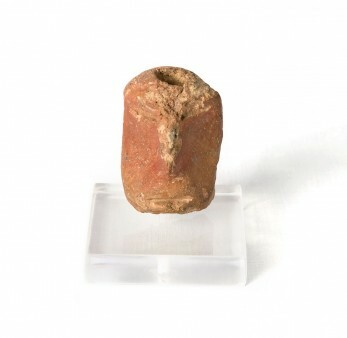 The findings from Aghios Galas include vessels for use or storage, while the earliest example in Chios of the rendering of the human form in clay is the head that decorated the rim of a vase from the Final Neolithic period (fig. 5). Another aspect of the use of the caves is that of places of worship. 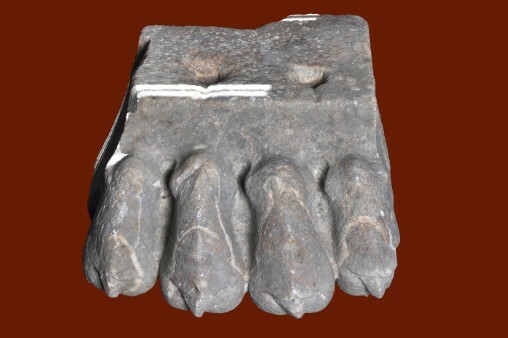 In later periods the chthonic character of a cave and its impressive environment became associated with cults. 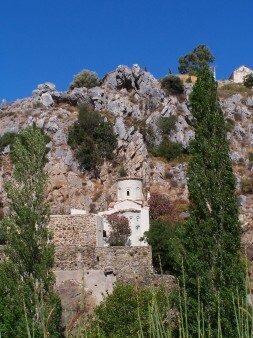 This is precisely what happened in the middle cave of Aghios Galas, that was used as a place of worship from Archaic times continuing up to the13th to 14th c., when the church of the Virgin Mary, Panaghia Aghiogalousaina, was built in its entrance and became a place of pilgrimage down to our times (fig. 6). 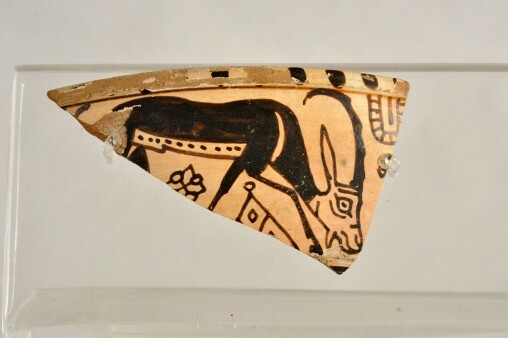 In Emporio, another important site, excavations were carried out by the British School at Athens between 1952 and 1955, in the western foothills of the low rocky hill south of the harbour, bringing to light the remains of a prehistoric settlement. The first inhabitants settled in Emporio in the Neolithic period, around 6000 BC. This location was ideal, combining a harbour suited to the ships of the period, a plain for farming and a source of drinking water. Around 3000 BC, the settlement was destroyed by fire caused either by an invasion of foreign tribes or some other event. It was rebuilt and in its final periods developed into a large urban centre of the Aegean, covering a region of over 7.4 acres. A well was the settlement’s key feature, properly protected by a series of large walls. The houses were one-storeyed with stone walls, an earthen floor and flat roof. Excavations brought to light vessels with a variety of shapes, made without using a potter’s wheel, except for a few of the last period. 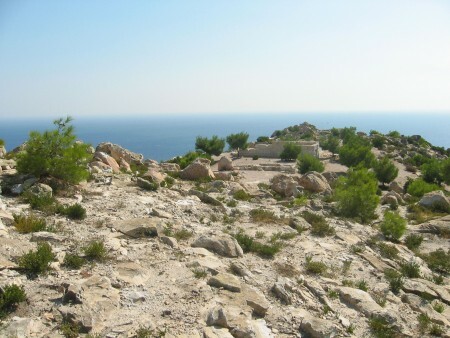 Stone and bone tools were also found, as well as hundreds of cores, flakes and blades of flint and obsidian, pointing towards trade relations with the island of Milos. An important and extensive settlement appeared in the same area around the 13 century BC. Its houses had big rooms and were built based on some central urban plan. 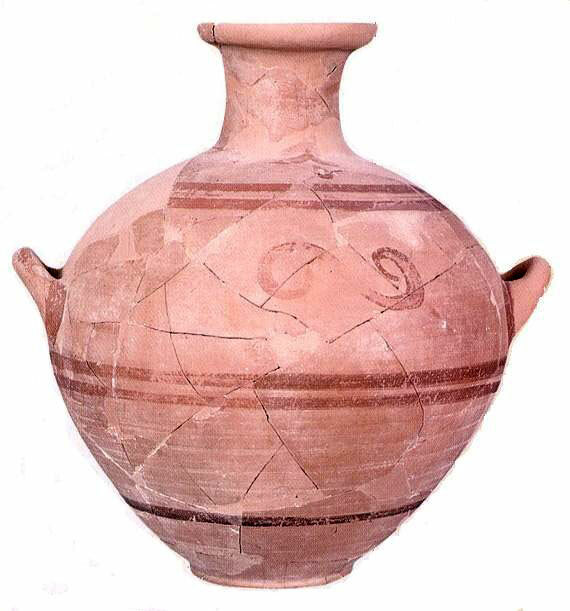 The vessels have various shapes and are decorated mainly with painted linear ornaments (fig. 8). The architectural elements and the moveable finds indicate relations between the settlement and places in the Aegean such as Euboea and Kea, among others. Around 1100 BC, the settlement was destroyed by fire and abandoned. Its end must have coincided with the beginning of Ionian colonization. Between 1050 and 950 BC, the Ionians of Attica and Euboea spread to the coast of Asia Minor and to the islands, from Chios to Samos and the Cyclades. Also arriving in Chios were Avantes from Euboea. 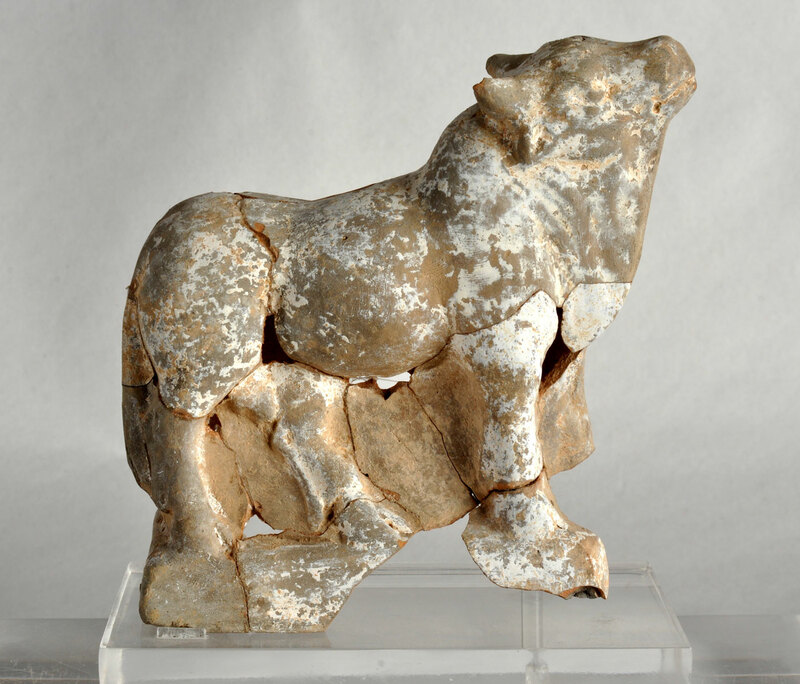 In the 8th c. BC, the era of political upheavals and the strengthening of the city state, Chios has sufficient territory and significant agricultural wealth. Over the next two centuries, there is a special development in trade and shipping and the people of Chios found a trading centre in Naukratis, Egypt. Geometric burials, excavated on various plots of land (note 4), are proof of the Ionians settling in the town of Chios. 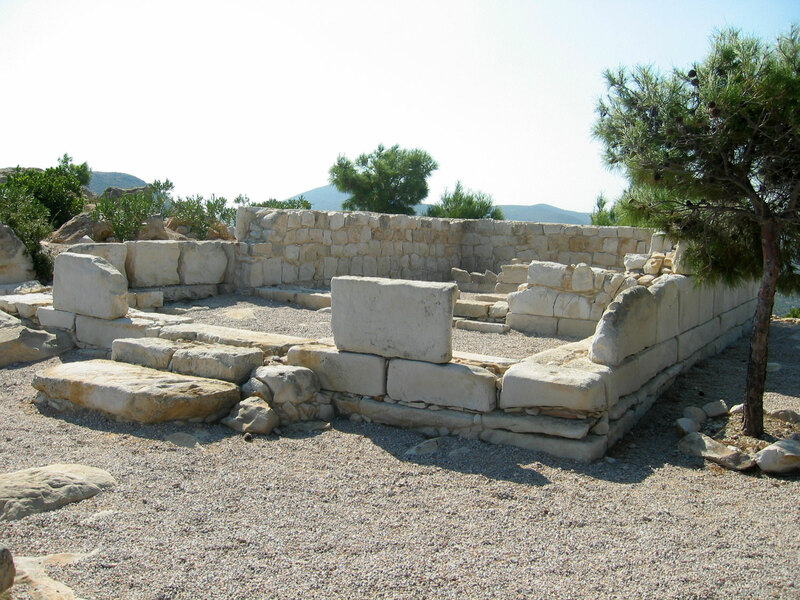 North of the Emporios port, J. Boardman, excavator of the British School of Archaeology, brought to light the remains of a settlement and acropolis of the early historical years (8th c. BC) (note 5).The settlement was founded by Ionian colonists from Euboea or Andros. On the Prophet Elias hill, on a suitably shaped plateau of approximately 6.1 acres, towered the acropolis fortified by a wall almost 800 m long. Close to the wall and in a key position inside the acropolis, the Hall (Megaron) was built , home of the local ruler and the settlement’s administrative centre. In the middle of the acropolis, the sanctuary of the patron goddess Athena was founded, which in the 8th c. BC had an open air altar (fig. 9). The temple dedicated to the goddess (fig. 10) was built in the 6th c. BC, destroyed at the beginning of the 5th c. BC and rebuilt in the third quarter of the 4th c. BC. Evidence that the temple was dedicated to Athena is supplied by the types of offering, mainly, however, by the shard of a Chian cup (kylix) inscribed with the name of the goddess, dating from the 2nd quarter of the 6th c. BC. Boardman was of the opinion that the spear and the leaden heads of griffins, found in the temple, belong to the archaic wooden statue. 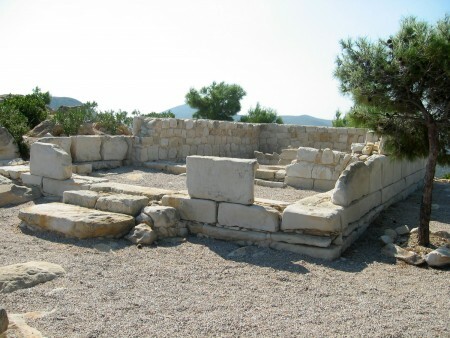 The existence of different types of houses, combined with the existence of the Hall (Megaron) on the fortified acropolis, are characteristic features of the political organization and social stratification in the settlement, that was abandoned peacefully at the end of the 7th c. BC. Since it was never re-inhabited, its character was preserved intact, as a rare example of a settlement from the early historical years. The settlement’s official, large sanctuary was situated near the port and is known as the Harbour Sanctuary.Most of it was excavated by the British School at Athens headed by J. Boardman (note 6). Earlier clues on the place being used for worship go back to Mycenaean times. The first temple, from the mid-6th century, was destroyed in 493 BC. by the Persians after the failed Ionian uprising and a more magnificent building was reconstructed in the 2nd quarter of the 5th c. BC. Only a part of this classical temple’s foundations survived in situ. Almost all its architectural members were used in the early Christian basilica and in later buildings in the wider area. Above the architrave, in place of the frieze, was an intricately carved Ionian moulding decorated with palmettes, tendrils and lotus buds. The base of the pilaster in the form of a lion’s foot is artistically striking and original (fig. 12). The sanctuary, with repairs and modifications made to it when required, operated throughout Antiquity. In Roman times, a basilica was built next to the temple and later on, around the 6th century, a large Christian basilica with its baptistery was erected. 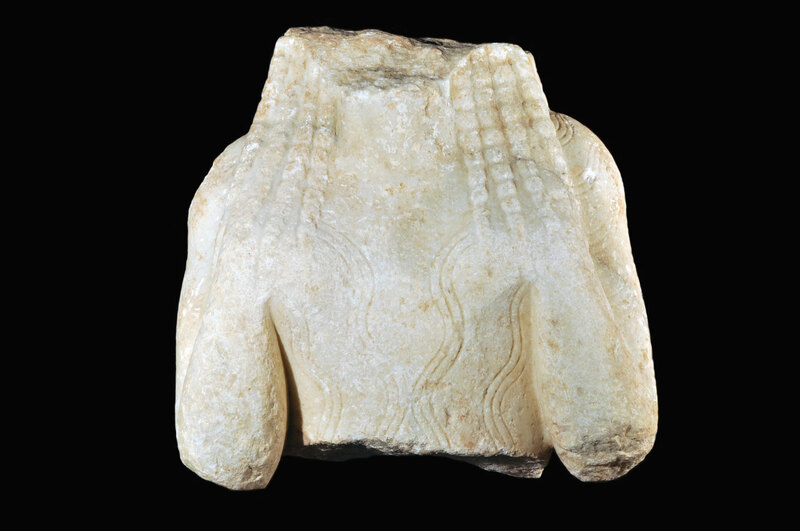 Many objects of worship and offerings were found in excavation surveys: Pieces of marble statues, figurines, vases (fig. 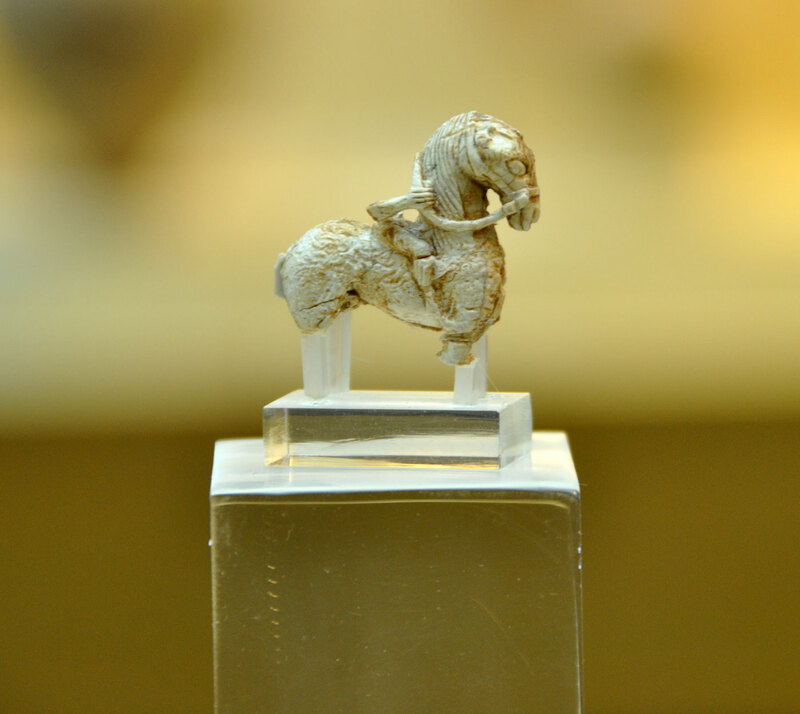 11), seals, jewellery, tools, elegant artefacts such as an ivory horseman (fig. 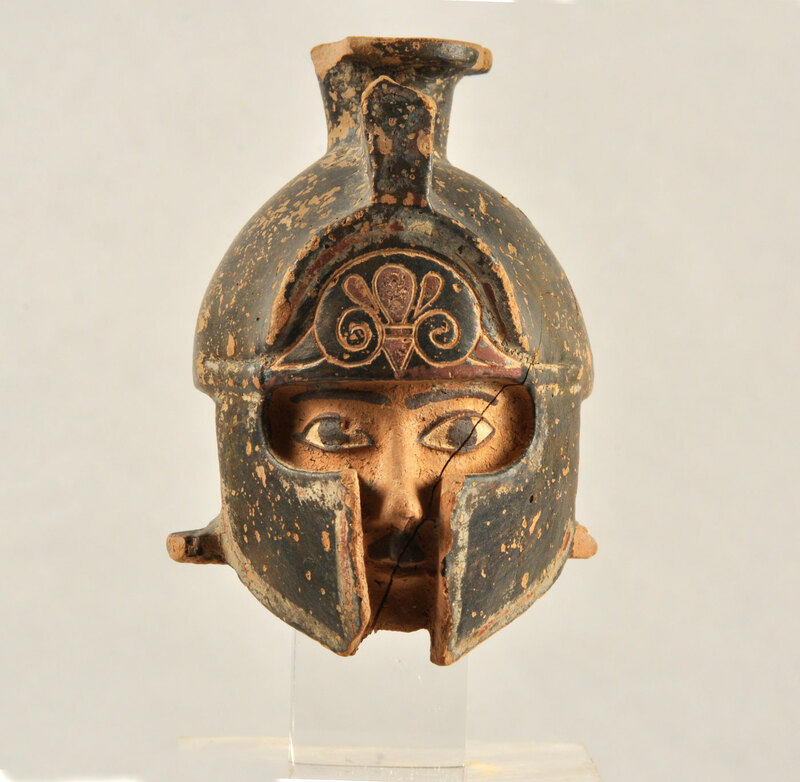 14), gorgeous copper objects, offerings from other regions, figurines of faience, Egyptian scarabs, vases from Euboea, the Cyclades and the Southeastern Aegean, Cyprus, Corinth and Attica. All the above show not only the scope of the sanctuary but also the way Chios came into contact with other regions of the ancient world. The sanctuary was dedicated to the worship of Artemis and Apollo, both greatly loved as gods in Chios. The copper belts worn by women were impressive finds, offered by girls to the goddess before their wedding. The most magnificent temple, dedicated to Apollo, Artemis and their mother Leto was on the site of “Kato Phana” (note 7). Regarding the name of the region, Aelius Herodianus mentions that “Cape Phanai in Chios is the place from where Delos was seen by Leto”. The archaic temple, from which only the primary foundation survives of its NE corner, was constructed at the end of the 6th c. BC. The size of architectural members concentrated in the vicinity prove that this temple was as large as its counterparts of the period in the Heraion of Samos, in Miletos and Ephesus in Asia Minor. The temple was destroyed in 493 BC, after the Ionian uprising and the naval battle of Ladi, and rebuilt in the first half of the 5th c. BC. 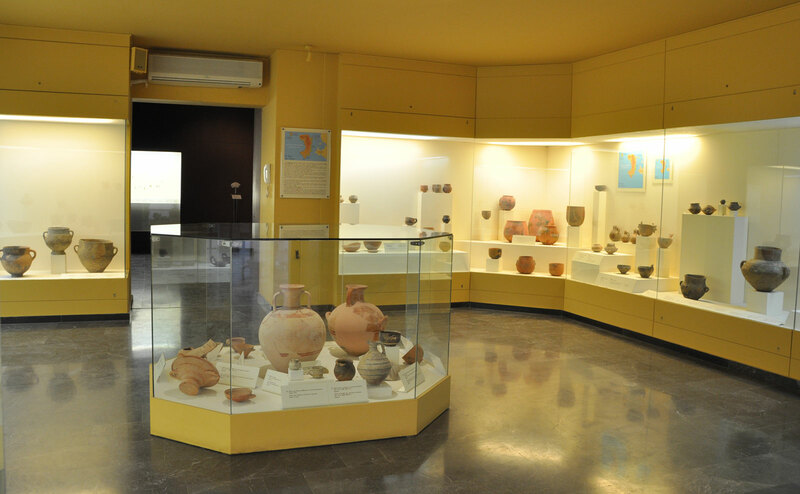 During this period, there were also sanctuaries in other parts of the island and in the city, as proved by excavations and isolated finds from various sites (note 8). The two marble korai from the region of Atsiki, exceptional examples of a Chian sculpture workshop (fig. 15), must surely have been dedicated to some important archaic sanctuary of the city. 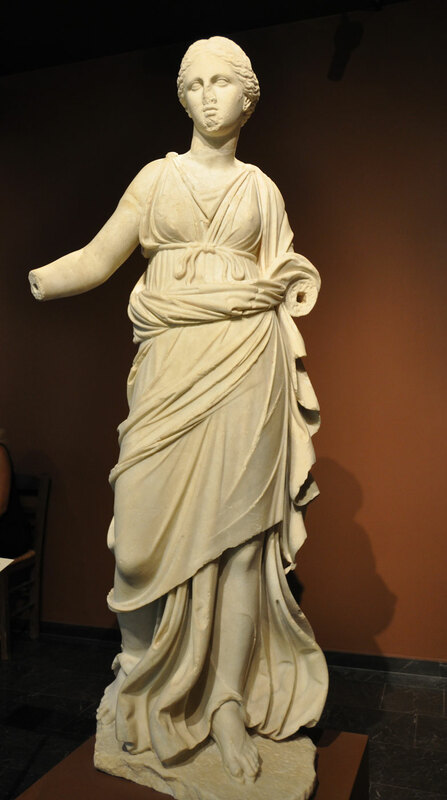 Chios seems to have had a long tradition of sculpture, with famous representatives such as Mikkiades, Archermos, and his sons Voupalos and Athinis, whose works adorned not only Chios and other Greek cities but even Rome itself. 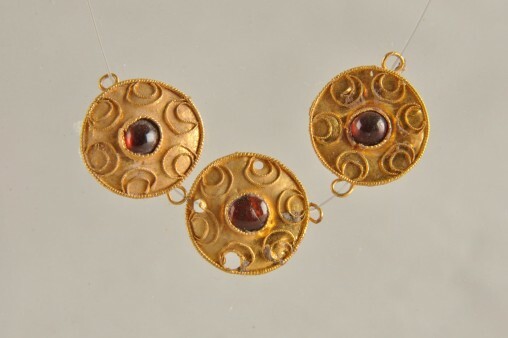 The flourishing economy of Chios in archaic times offered scope for the island’s artistic development. 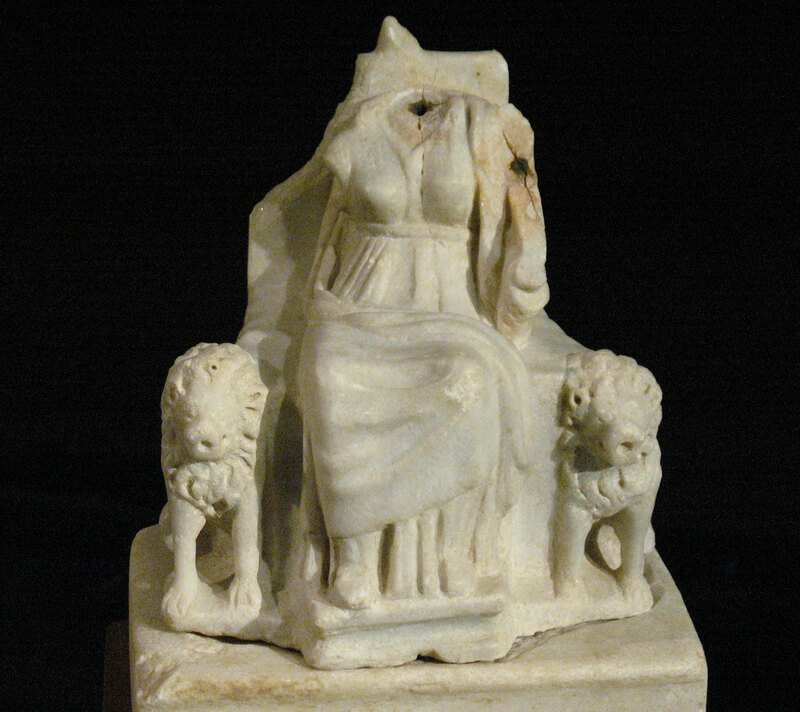 The worship of Cybele (fig. 16) was also particularly widespread from Archaic to Roman times and the 6th c. BC open air sanctuary at Daskalopetra in Vrondathos was dedicated to her worship. Grey marble columns with carved imagery form a particular category of monument, present in Chios from archaic times and whose tradition continues to the 3rd c. BC (note 9) (fig. 17). This particular type is encountered only in Chios and Boeotia and shows a close cultural association between the two regions. The art of vase painting in Chios flourishes particularly in archaic times. 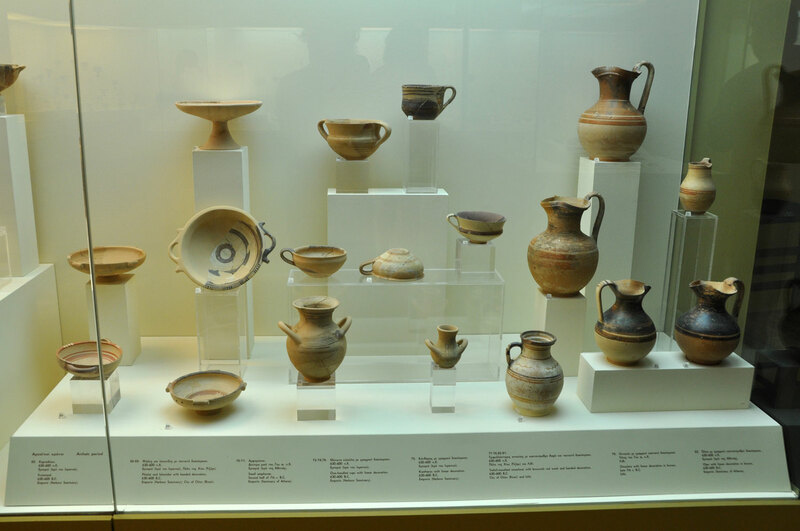 Apart from large vases with linear decoration such as wide mouthed horned amphorai and urns, Chian ceramic workshops of the 7th and 6th c. BC produced exceptional examples which are part of Ionian art in general, with strong eastern influences. Τhe styles of the Wild Goats (fig. 18), the Sphinxes and the Lions (figs. 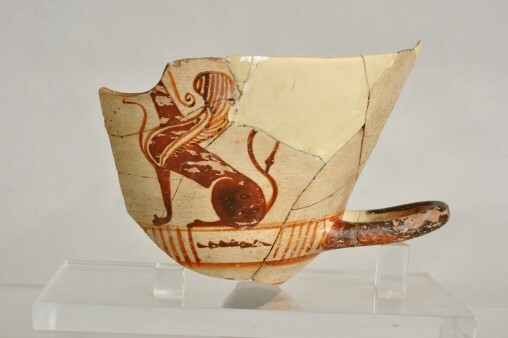 19-20), the styles of the Animal Cups (Kylikes) and those of Kylix and Komaston are represented by a number of vases found in Chios, but also in the colony of Naukratos in Egypt. 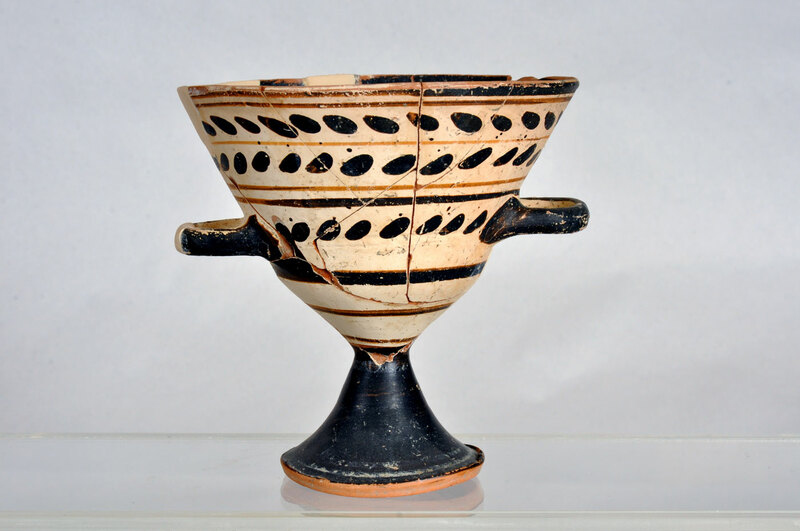 The shape of vase for which Chios is famed for during this period is the Chian cup, whose evolution one can follow through to Hellenistic times (fig. 21). Despite the catastrophe and Persian rule, Chios quickly regained its economic prosperity. After the naval battle of Mykale, which essentially marked the end of the Persian wars, Chios, like other Greek cities, got rid of the tyrant Stratti and the Persian garrison, and independent and free from taxation joins the Athenian League in 478 BC. The people of Chios engage once more in traffic in transit becoming “the richest among Greeks”, as mentioned by Thucydides. They supply the markets with their own agricultural products and famous wine which they transport in amphorae made locally, whose workshops producing them have been excavated in various spots of the town of Chios. The local myths of the island are also associated with the art of viticulture, so prevalent in Chios during Antiquity, regarding Oinopionas, son of Dionysus, as the first king and settler. Pseudoapollodoros and Diodoros of Sicily are the sources of these traditions. According to the myth, Dionysus sent his son to teach the people of Chios the art of cultivating vines, producing wine and spreading the god’s worship. The Sphinx is likewise part of these local myths, being the guard of Oinopionas’ tomb, patron of the city and a timeless symbol of Chios. Her presence on the obverseofthecoins(fig. 22), either with her leg stretched out on the horned amphora, on the prow of a ship, or holding a bunch of grapes, declares her holy protection and participation in important activities of the island (note 10). 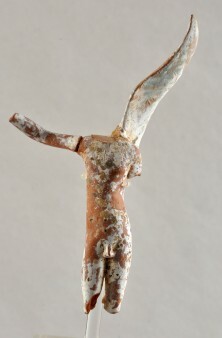 Works of sculpture and terracotta figurines found on the island (fig. 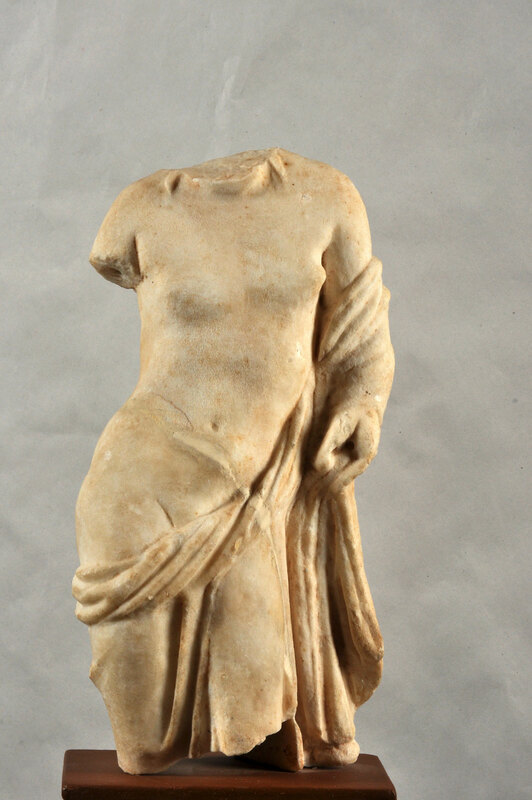 23) are proof of the widespread worship of Aphrodite during Hellenistic and Roman times. The snake, a well known chthonic symbol often encountered as an ornament of the goddess, stresses her association with the earth’s fertility. Her most famous follower, however, was Eros/Cupid, the winged god of love who, when aiming his arrows at two people, made them fall passionately in love. In 1964, the late Ant. Stephanou, temporary Curator of Antiquities, had gathered from the Rizari district in the town of Chios, figurines of winged cupids with a white coating and traces of the original vibrant yet subtle colours of light blue, peach and gold (fig. 24). 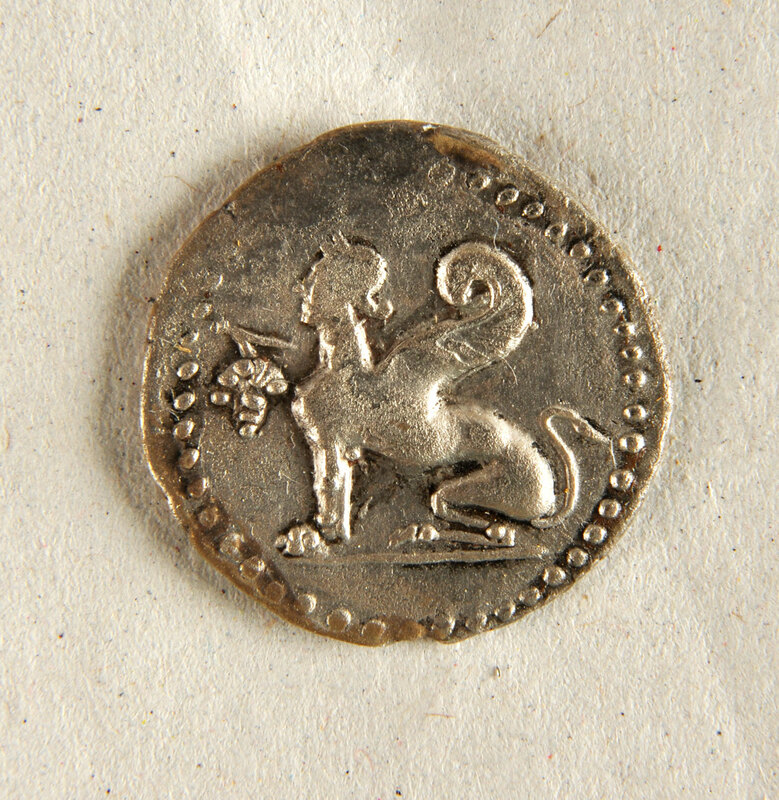 Inthesamepit, smalldollswerefoundin the style of prostitutes (fig. 25), which point to a sanctuary of Aphrodite in the district. 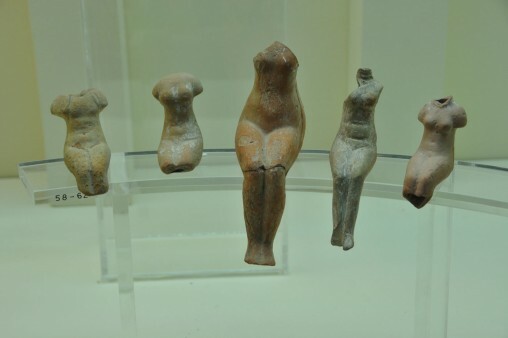 These latter figurines suggest what is known as sacred prostitution. They are works of a local workshop for terracotta figurines, strongly influenced by the respective workshop in Myrina, Asia Minor. Its subject matter is rich, with figurines of gods, Aphrodite in particular, in a prominent place, as well as figurines of cupids and dancers, tragic masks etc. Sculptures, figurines, vases and every type of object are tangible evidence of people’s public and private life, transferring part of the aura of those who either made them, used them or offered them as gifts to their gods. 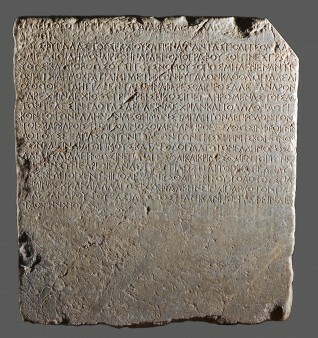 Likewise, inscriptions are a very important source of information, when combined with the texts of ancient Greek writers. 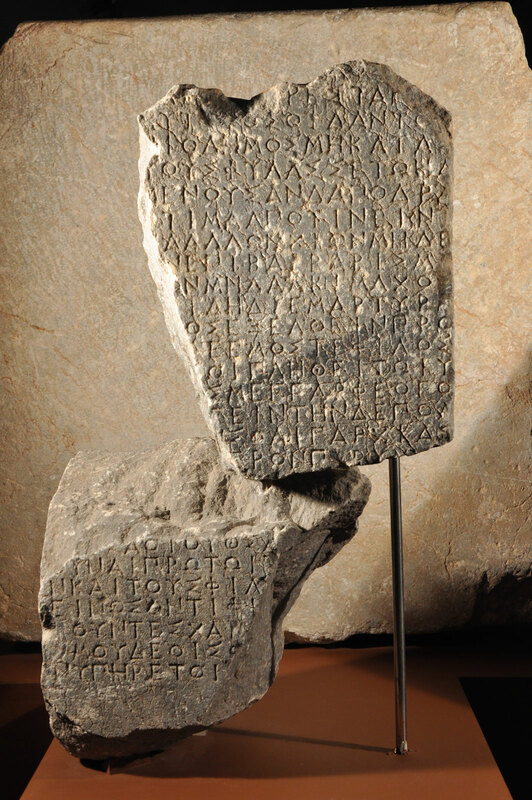 It is fortunate that many inscriptions have been found in Chios, offering us valuable information on the island’s historical past (note 11). Virtually all of them have been collected by the scholars of Chios and curators of Antiquities, Konstantinos Kanellakis, Yiogios Zolotas, Christos Sarikakis and Antonios Stephanou. 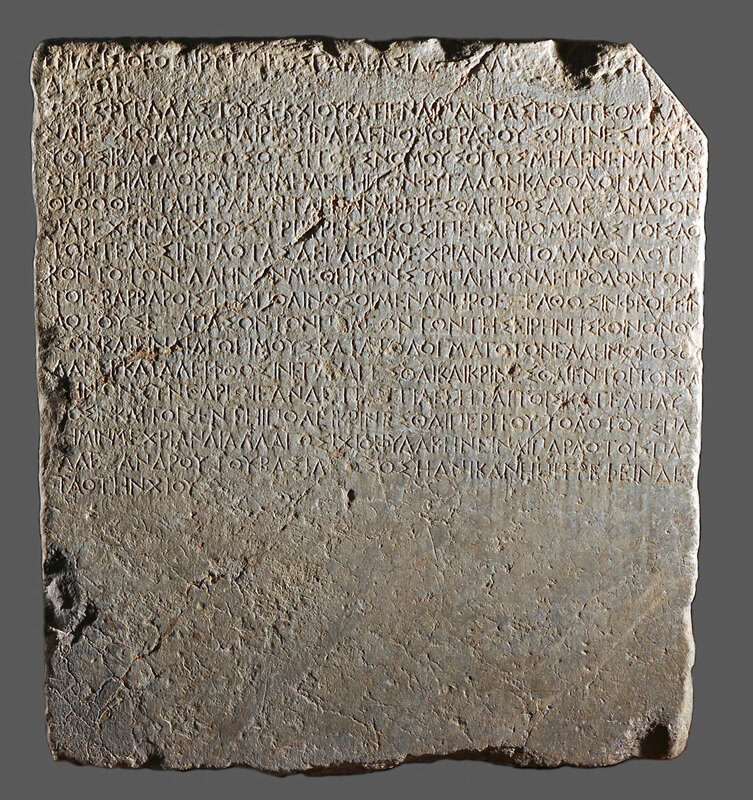 In these inscriptions we find facts about the island’s ancient dialect, political and tribal organization, worship of various gods, relations of Chios with other city states and Hellenistic kingdoms. Thus we know that in Chios, during archaic and early classical times, there was a People’s Parliament and a King, that the institution of the consul existed in Chios as in other cities, i.e. the recognition of the right of foreigners to officially represent the city before their own country’s authorities. We also learn that, around 320 BC, judges from Andros and Naxos were summoned by the Chian Municipality to try cases of citizens pending. Inscriptions of proficiency in performance i.e. donations of money by Chian citizens to improve the city’s fortifications, refer to the adventures occasionally encountered by Chios, when defecting e.g. from the Athenian League in 412 BC or when the city was besieged, in 201 BC, by Philip V of Macedonia. 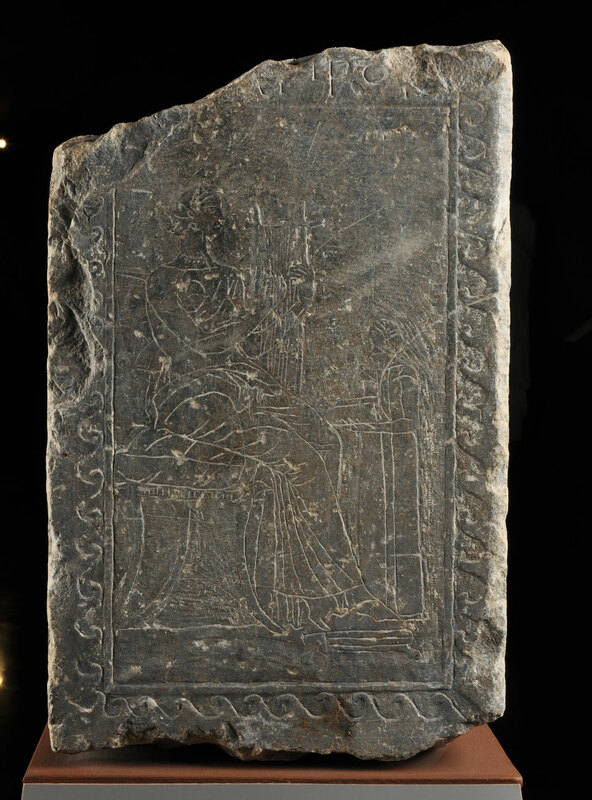 One of the most important and rare inscriptions are the texts of two epistles, dating from 332 BC, from Alexander the Great to the Chian Municipality. At the time, Chios was convulsed by violent political clashes between the democrats who favoured Macedonia and the oligarchs who supported Persia. In 334 BC, when Alexander was departing from Pella on his great campaign, Chios was ruled by a group of pro-Persian oligarchs which facilitated the installation of a Persian garrison on the island. Subsequently, Alexander became regulator of political matters in Chios. Epistle I is a diagram, i.e. an order by which the king demands the return of political exiles, restores democracy and orders the election of legislators to draft new laws and correct the old ones. It also states the obligations of the Chians towards himself, andauthorizes the stay of the Macedonian garrison on the island for as long as necessary (fig. 26). That same year and immediately following the first, epistle II must have been sent, that refers to the trials of the pro-Persian traitors. Though it is a letter of a public nature, Alexander asks the Chian Municipality to show leniency towards a friend of his who was accused of being pro-Persian, by emphasizing his friend’s actions in favour of the Municipality (fig. 27). 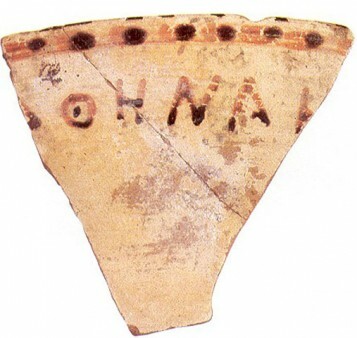 During the period of Roman rule, Chios maintained friendly relations with Rome and was declared free and exempt from taxation, as we know today from inscriptions and literary testimonies. 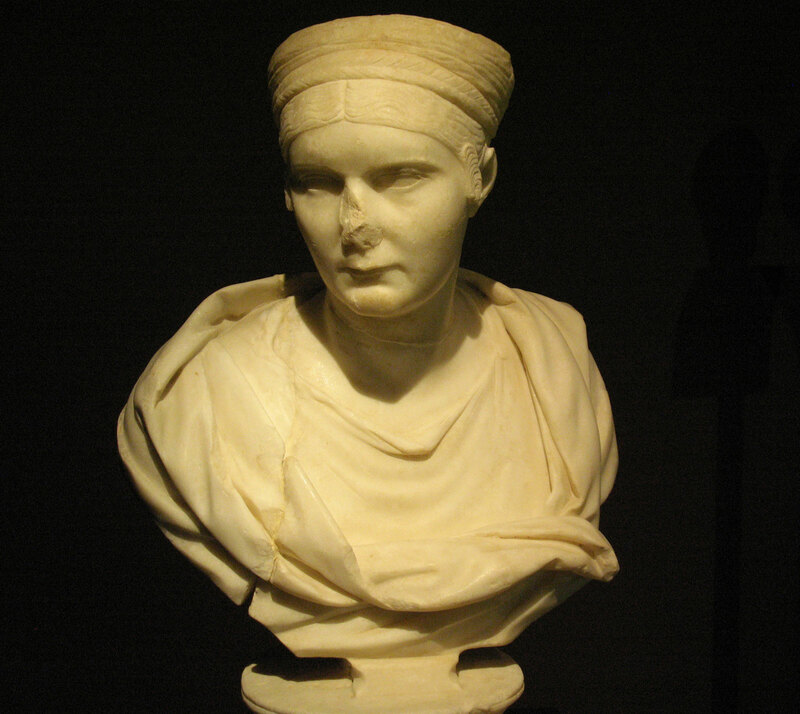 This is confirmed by the museum’s exceptional collection of Roman portraits, both imperial and private (fig. 28). They come from the rescue excavation of a plot of land in the Aghios Iakovos quarter in the town centre, where the Roman agora is located. These portraits were found buried in a closed pit sealed by a public building, together with heads of gods and a statue of Nike/Victory (note 12) (fig. 29). 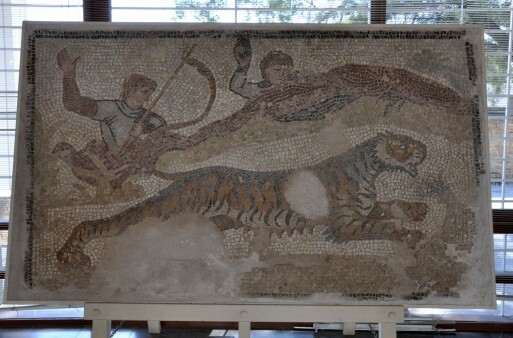 From the same site, probably from a late roman public building, come the mosaic floors depicting hunting scenes, exhibited in the Museum lobby (note 13) (fig. 30). 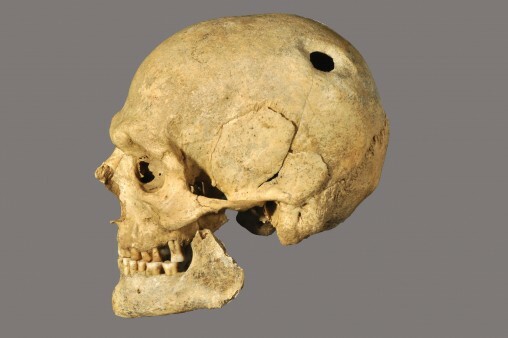 The progress made in medicine during historic times and the profound knowledge possessed by doctors of Antiquity, led by Hippocrates, is reflected in the case of the trepanism of Chios (note 14) (fig. 31), dating from the 2nd c. BC and one of the few cases known either in Greece or worldwide. It is the skull of an adult male, whose grave I was fortunate to excavate in 2003, who underwent surgery after a skull fracture and survived for an unknown period of time. In Hippocrates’s text Iatrika/On Medicine, the method of cranial drilling, as this specific operation is called, is described in detail and even provides instructions for the post operative treatment of patients. Man has always been a tragic figure. He is born, lives, creates, falls in love, struggles, hopes, fears, all in the knowledge that his fate is to die. Sadness for parting on their last journey is reflected in the faces and attitudes of the dead on the grave headstones (stelai), who are bidding farewell to their loved ones, while the hand shake reveals the inseparable unity of both worlds, giving a philosophical perspective to these works (fig. 32). 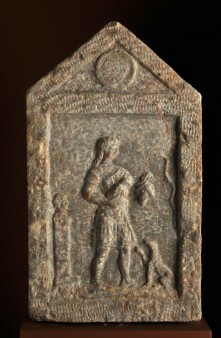 Other headstones depict the deceased’s occupations in life, such as those of the farmers (fig. 33). Moreover, in the funeral banquets (fig. 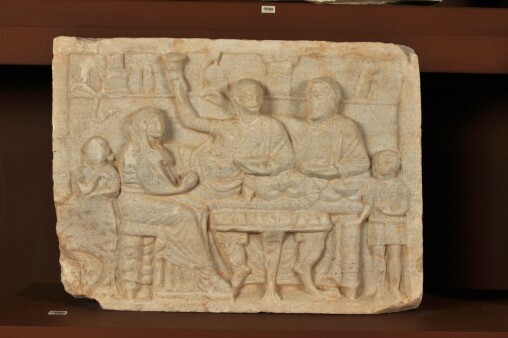 34), depicted on grave stelai after the 4th c. BC, we see the deceased in the centre, not treated as a hero, participating in the banquet given in his honour by his relatives. The pain of the mother who has lost her only child is timeless, just as deep and depicted in the most moving way in the funerary gifts in children’s graves, such as the pithos burial of a child in a Chian amphora along with his toys. The small cow and the bottles with teats have been placed there for the child not to miss the milk that his mother can no longer offer him (fig. 35). Regardless to who the offerings belonged to, whether man or woman, athlete, humble worker, whether famous or anonymous, rich or poor (figs. 36-38), they all carry something of the aura of the people who touched them and lived in times that now seem distant to us. They were, nevertheless, people like ourselves, whose past, mistakes, feats and history can teach us something. Ultimately, the human spirit is unchanging. Furthermore, let us not forget that whatever we do in our lives, individually or collectively and whatever we hand down to those who come after us, will determine our success or failure in honouring our presence in this world and the way in which our descendents will remember us. 1. Δ. Φιλιππίδης, Νεοελληνική Αρχιτεκτονική, «ΜΕΛΙΣΣΑ», 1984, p. 344-345. 2. Α. Αρχοντίδου-Αργύρη, Μακεδονικοί Τάφοι, in Α. Αρχοντίδου-Αργύρη / Θ. Κυριακοπούλου (eds. ), Χίος τ΄ ἔναλος πόλις Οἰνοπίωνος, Υπουργείο Πολιτισμού – Κ´ Εφορεία Προϊστορικών και Κλασικών Αρχαιοτήτων, Chios 2000, p. 210-317. 3. S. Hood, Excavation in Chios 1938-1955, Prehistoric Emporio and Ayio Gala, Oxford 1981-1982. 4. Αθηνά Ζαχαρού-Λουτράρη / Α. Τσαραβόπουλος, Αρχαιολογικά Χρονικά της Χίου 1984, and Χιακά Χρονικά 16 (1984) 108, 3. ΑΔ 42 (1987) Χρονικά, σ. 475. ΑΔ 43 (1988) Χρονικά 454. ΑΔ, 44 (1989) Χρονικά, σ. 397–398. Α. Αρχοντίδου-Αργύρη, Πρωτογεωμετρική κεραμική από τη Χίο, in Ν. Χρ. Σταμπολίδης / Α. Γιαννικουρή (eds. ), Πρακτικά του Διεθνούς Συμποσίου, Rhodes 2002, p. 207-214. 5. J. Boardman, Excavations in Chios 1952-1955. Greek Emporio, Oxford 1967, and Εμποριό. Ένας οικισμός των πρώιμων ιστορικών χρόνων, ed. Α. Αρχοντίδου-Αργύρη, Chios 2003. 6. Ibid. and J. Boardman, «Chian and Early Ionic Architecture», Antiquaries Journal (1959), p. 170-218. 7. W. Lamb, Excavations at Kato Phana in Chios, BSA 35 (1934-5), p. 138-164. 8. Δ.Α. Τσαρδάκα, Συμβολή στην ιστορική τοπογραφία της αρχαίας πόλεως Χίου. Νέα στοιχεία από τις σωστικές ανασκαφές των ετών 1985–2013, ΗΟΡΟΣ 22–25 (2010-2013), p. 481-518. 9. F. Studniczka, Aus Chios, AM 13 (1888), p. 195-201. N.M. Kontoleon, Monuments a decoration gravee du Musee de Chios, BCH 71/2 (1947-48), p. 273-301 and 73 (1949), p. 384-397. E. Pfuhl, Masterpieces of Greek Drawing and Painting (Translated by J.D. Beazley), London 1926, pp. 84-86, plates. 78-80. E. Pfuhl / H. Möbius, Die ostgriechischen Grabreliefs II, Mainz 1977-79, p. 566-568, pl. 330-331 (see also for further reading). 10. A. Ζαχαρού-Λουτράρη, ΧΙΑΚΗ ΣΦΙΓΓΑ Η διαχρονική πορεία ενός τοπικού συμβόλου, Chios 1998. 11. Γ.Ε. Μαλούχου / Α.Π. Ματθαίου, Επιγραφές του Μουσείου Χίου (summary of catalogue),Greek Epigraphic Society, Athens 2002 (see also for further reading). 12. Θ. Κυριακοπούλου, «Ρωμαϊκή Προσωπογραφία», in Α. Αρχοντίδου-Αργύρη / Θ. Κυριακοπούλου (eds. ), Χίος τ’ ἔναλος πόλις Οἰνοπίωνος, Υπουργείο Πολιτισμού - Κ΄ Εφορεία Προϊστορικών και Κλασικών Αρχαιοτήτων, Chios 2000, p. 140-149. 13. Γ. Μαστορόπουλος / A. Τσαραβόπουλος, Ψηφιδωτό δάπεδο στη Χίο, Χιακά Χρονικά 14 (1982), p. 4-8 and Α. Tsaravopoulos, A mosaic floor in Chios, in J. Boardman – E. Vaphopoulou-Richardson (eds. 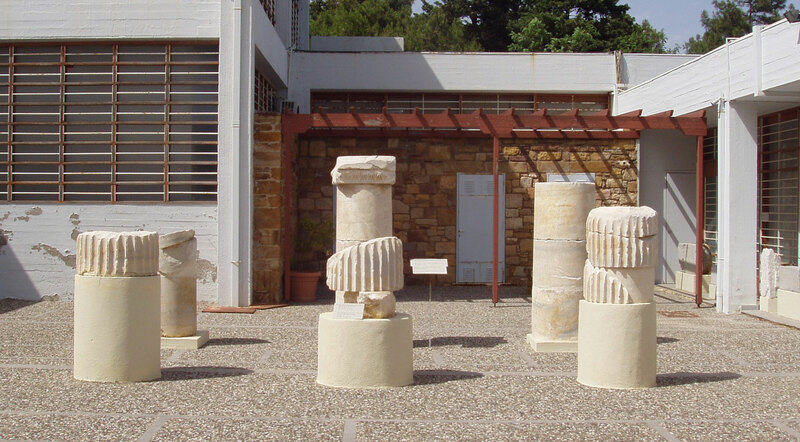 ), Chios: A Conference at the Homereion in Chios 1984, Oxford 1986, p. 305-315. 14. Αστέριος Αηδόνης, «Κρανίο άνδρα με ίχνη χειρουργικής επέμβασης», in Ν. Σταμπολίδης / Γ. Τασούλας (eds. ), ΙΑΣΙΣ Υγεία, Νόσος, Θεραπεία από τον Όμηρο στον Γαληνό, Athens 2014, p. 260-261.